Always ensure that the correct voltage is available. In many cases user's interpretation of a frequency converter is that you could supply the unit with single-phase 220VAC and control a three-phase motor rated for 380VAC. 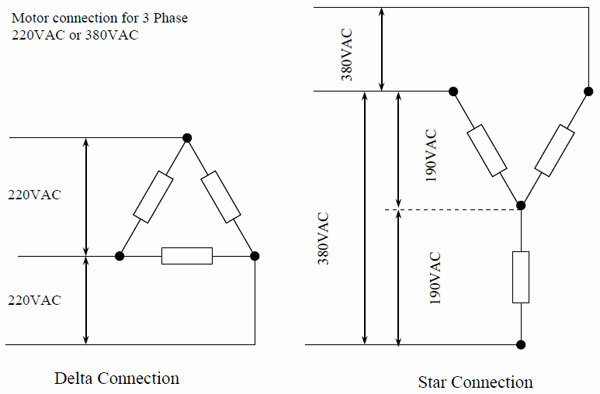 Most standard induction motors could operate with three phase 380VAC with all six leads from the windings available and connected in a Star configuration. The same motor could operate with 3 Phase 220VAC if the leads from the windings are connected in a Delta configuration. However consult with the motor manufacturer if it is not indicated on the motor nameplate. It is not totally correct to select a frequency converter according to motor capacity in "HP". It is better to choose a frequency converter based on the rated current of a motor. If the frequency converter and the motor have the same capacity size (HP), an increase in the number of motor poles reduces the efficiency and power factor of the motor increasing the rated current value. If we look at the following calculations we will understand why torque loss happens when running a motor above base speed. This will also explain some of the basic requirements why torque is an important factor when choose a frequency converter. A Mechanical Engineer designs a machine that requires 405 Nm and a speed range from 100 to 175 rpm. By fitting a 10/1 ratio gearbox to the machine he reduces the input torque required to 40.5 Nm, the minimum and maximum input speed increases to 700 and 1750rpm respectively. A four-pole 7.5kW motor (1500 rpm @ 50Hz) produces 47.8 Nm. We need to calculate if he will produce enough torque at the maximum speed. To reduce the speed to 1000 rpm is not a problem, as long as he keeps the motor speed above 50% of the base speed to produce enough cooling. A frequency converter will produce the full load torque of the motor up to the base frequency by changing the voltage to produce the necessary torque. Once the motor reaches its base speed and supply voltage the frequency converter can only change the frequency supplied to the motor to increase the speed as the frequency converter cannot supply a higher voltage than the supply voltage. To calculate the torque produced by the 7.5kW at 1750 rpm we have to manipulate the above formula. Therefore the 7.5kW motor with a frequency converter fitted can produce the necessary torque at the correct speed. From this we can see that it is always necessary to check if the speed / torque range is within the capability of the Inverter and motor. In most hoisting applications, the motor must be kept at zero speed and in position for a short period of time allowing the mechanical brake to open or close. To keep the motor in this position the frequency converter injects DC into the motor that causes it to produce torque at standstill (Zero Speed), This type of braking is sometimes misunderstood as DC Bus braking, which is explained in the next section. When selecting a frequency converter, and the applications requires this function, ensure that it is the function required. DC Bus braking is to control the deceleration of induction motors without activating the over voltage protection function on frequency converters. When applications require a fast deceleration function or the load is very unstable it could be controlled with this function. There are various methods to solve the problem depending on the application. It could be done with a regenerative system, feeding energy back to the mains or with a brake unit and brake resistors dissipating the energy through external resistors. When using either the internal braking system of the frequency converter with resistors or an external brake unit with resistors we waste energy unnecessary. This, however, is the cheapest solution and unfortunately selected by most customers.